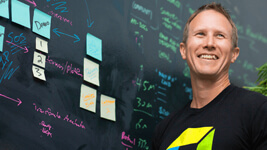 Application performance management (APM) is critical to business success today. 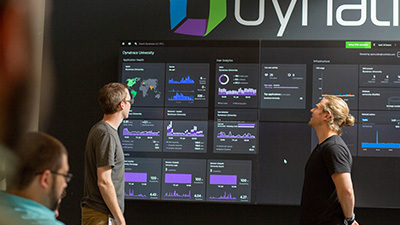 Dynatrace automatically sees and analyzes every single user transaction, all the time. 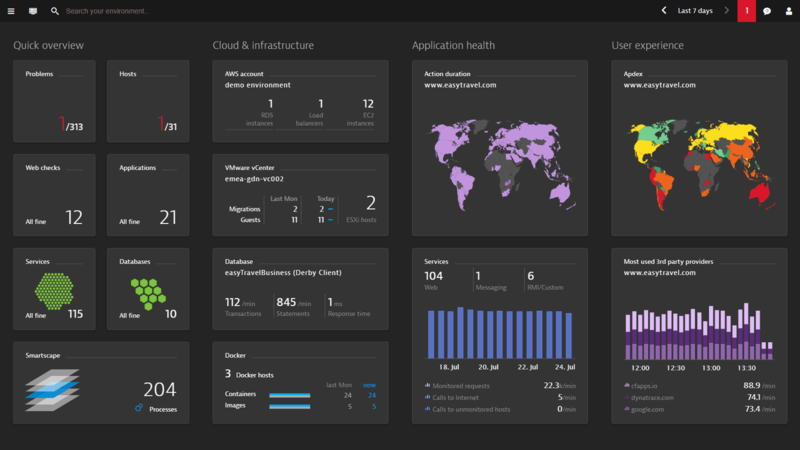 All relevant metrics, environment changes, and application deployments are shown in real-time. 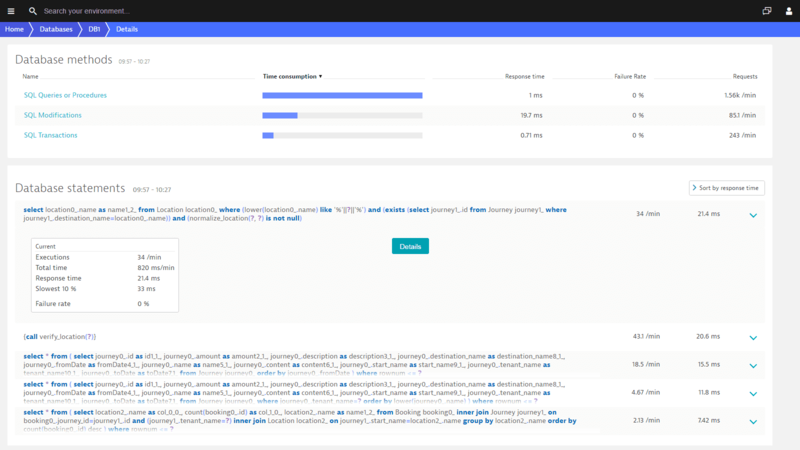 Pre-configured dashboards provide all relevant metrics down to the SQL statement and code level. 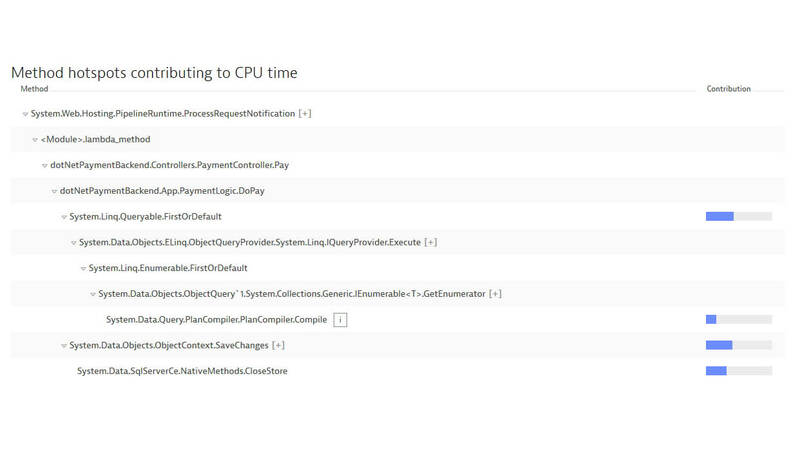 In under five minutes OneAgent automatically discovers your entire application stack. 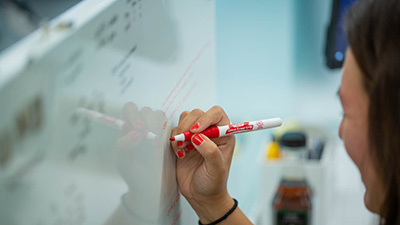 Drill into all services and components called upon with each user interaction. 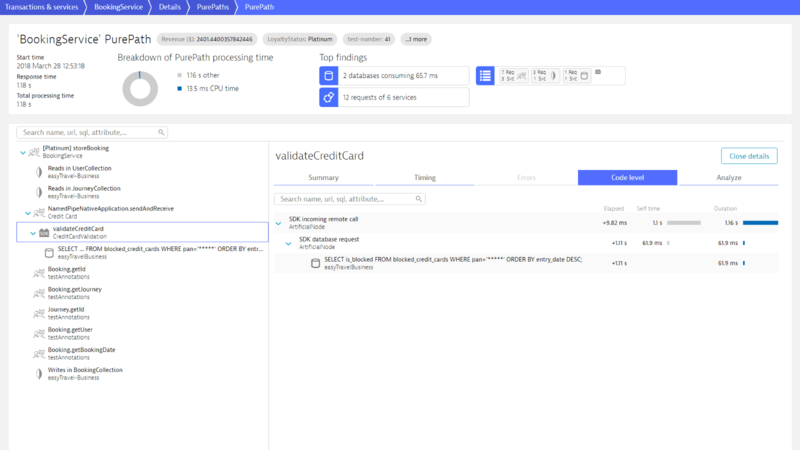 Understand the impact of methods and database statements on user experience using our unique Service backtrace feature. 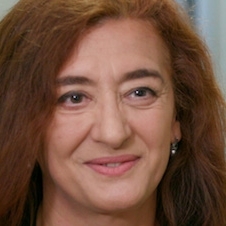 Why does some APM succeed where others fail? 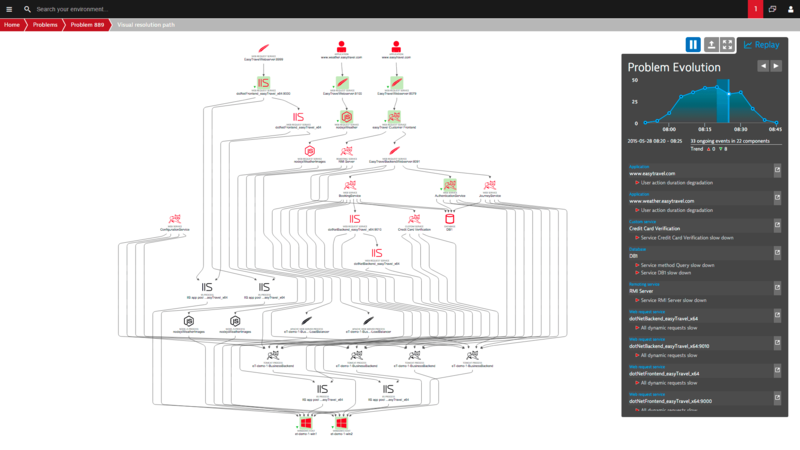 This blog post Choose an APM tool for the solution—not for the problem! 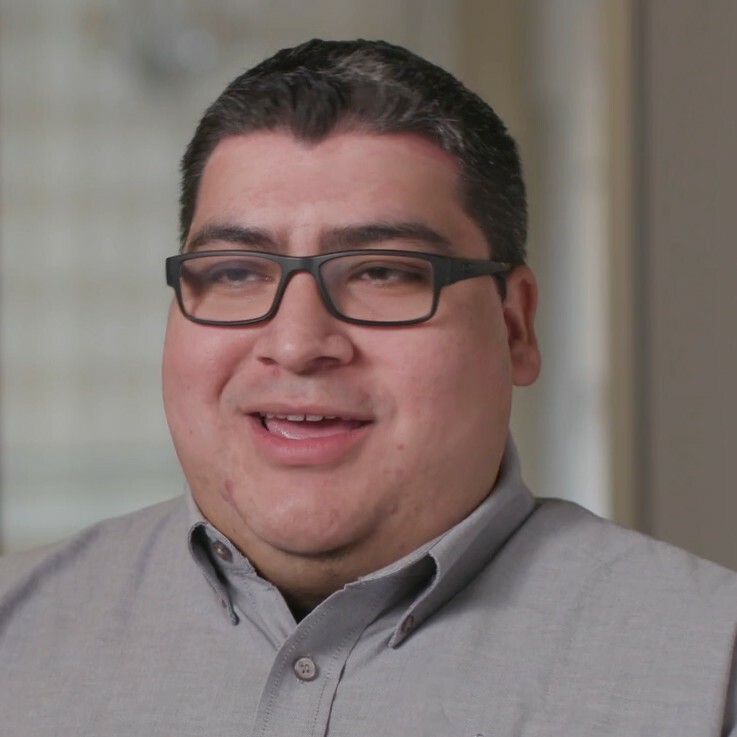 summarizes 4 factors to consider when looking at APM vendors. 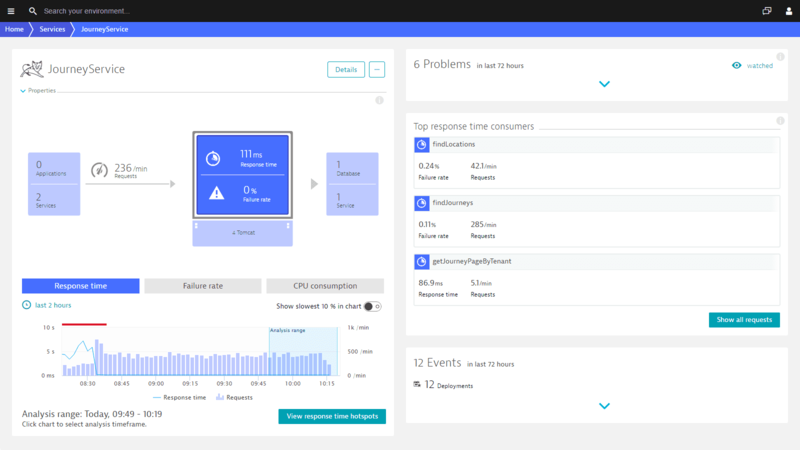 See all the Dynatrace blogs—about performance, digital customer experience, smarter monitoring for cloud natives. 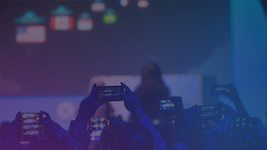 If you&apos;re responsible for your company&apos;s application performance, then don&apos;t miss out on our PurePerformance podcasts—the industry&apos;s leading source of real-world practical advice, best practices, and hard-won lessons learned. Be prepared to learn a lot about metrics. 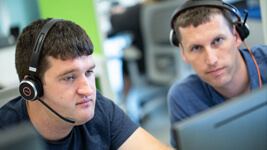 Register here for our on-demand webinar 5 Steps to Identify and Fix App Problems—FAST to learn how American Fidelity practically eliminated its application defect remediation cycle. 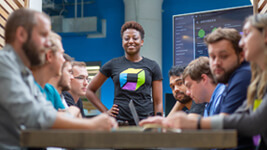 Sign up for Dynatrace application performance management today! 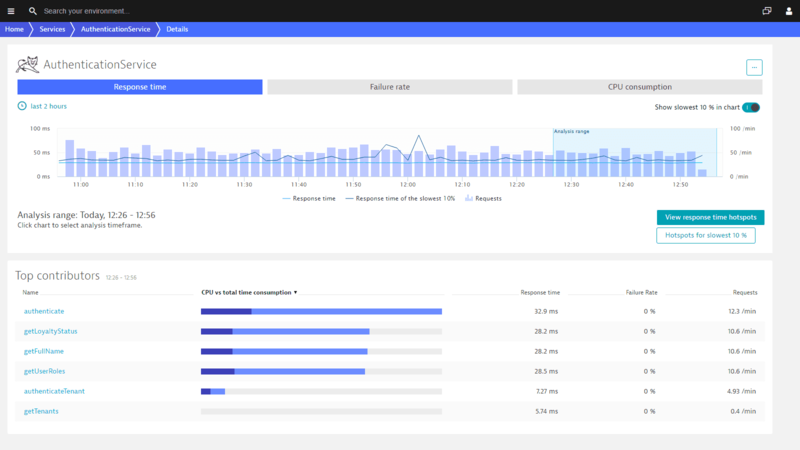 Dynatrace application performance management locates problematic methods throughout your entire stack, from user clicks to the application code. Identify methods that result in CPU or network bottlenecks. 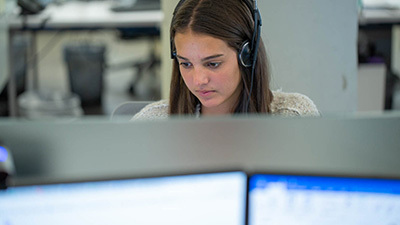 See a breakdown of service execution times at the method level and analyze failure rates. 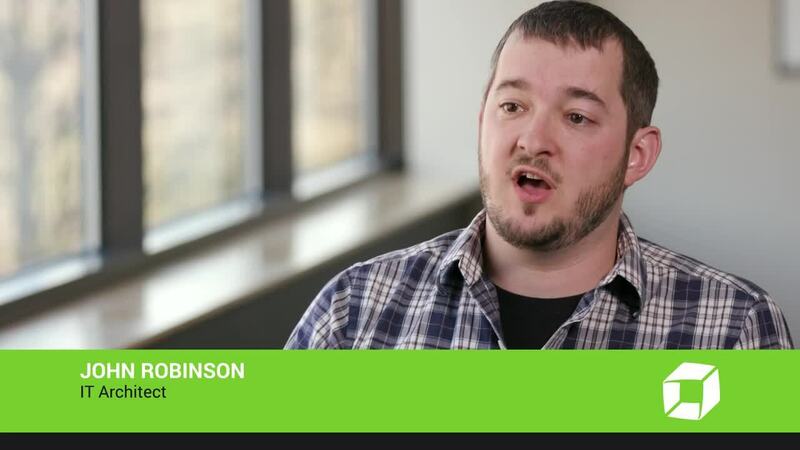 Get an overview of how much time is spent on garbage collection so you can tweak your application’s heap memory settings. 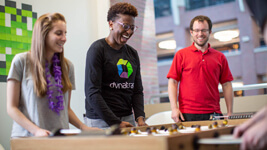 Download the Dynatrace fact sheet to learn how you can tame unruly applications before they become problems, moving you from reactive crisis mode to proactive management. 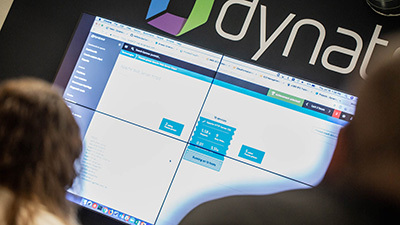 Sign up for Dynatrace APM today! 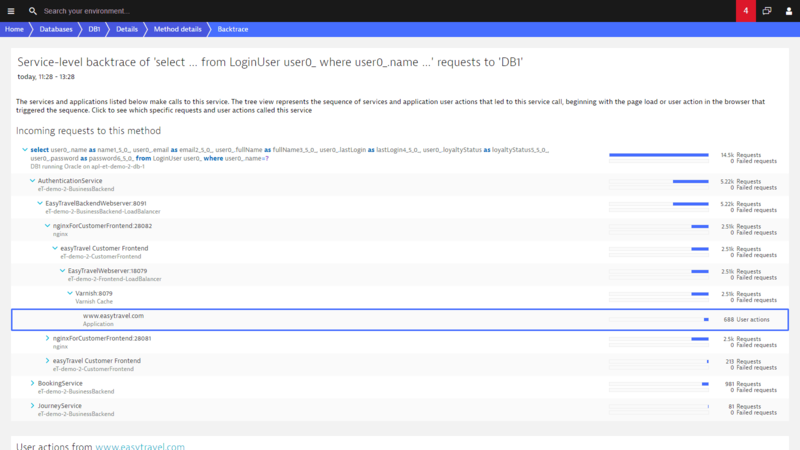 Dynatrace tracks and inspects all the SQL statements and NoSQL queries that your application sends out. 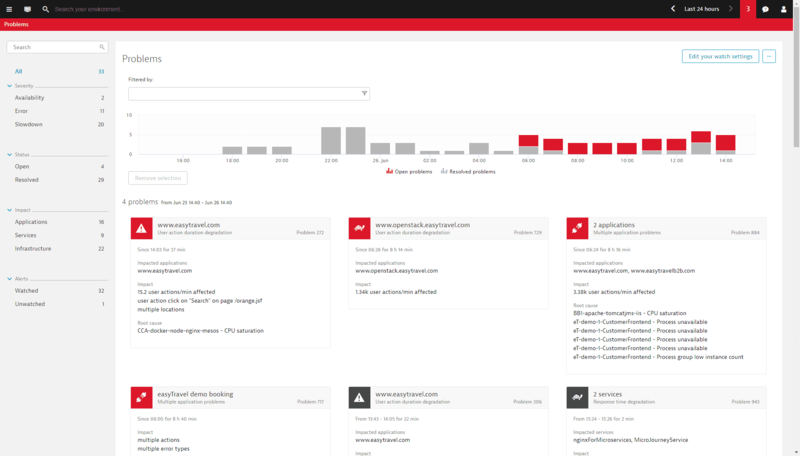 Get instant insight into database problems, in a single view. 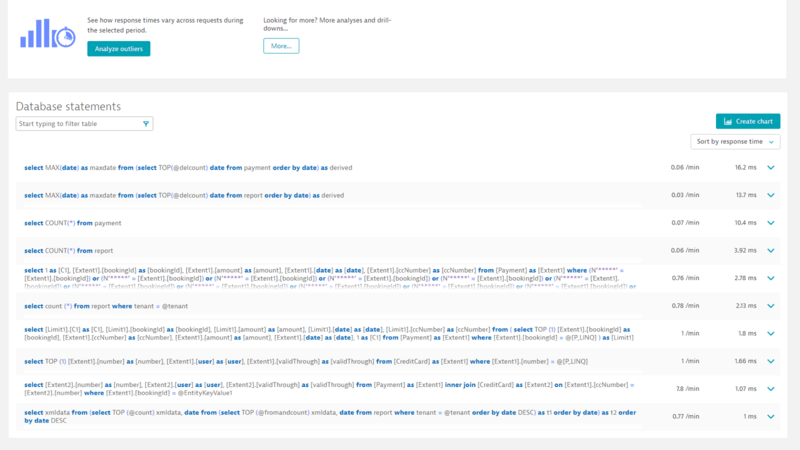 Databases are auto-detected and analyzed without manual configuration. 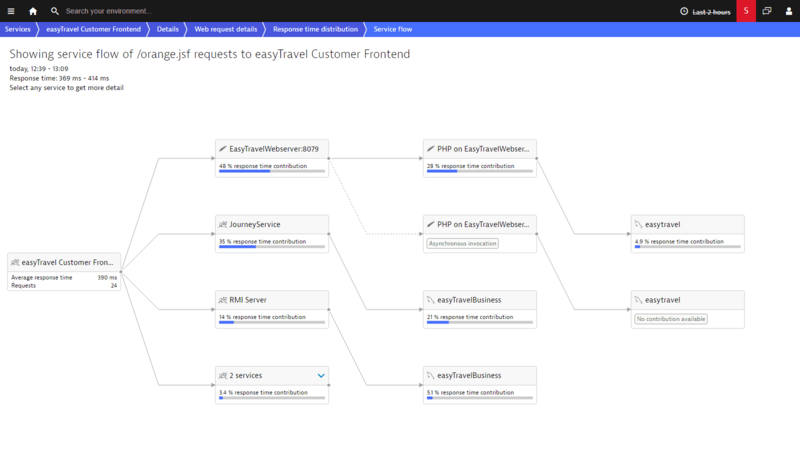 Dynatrace shows you the root causes of problems! 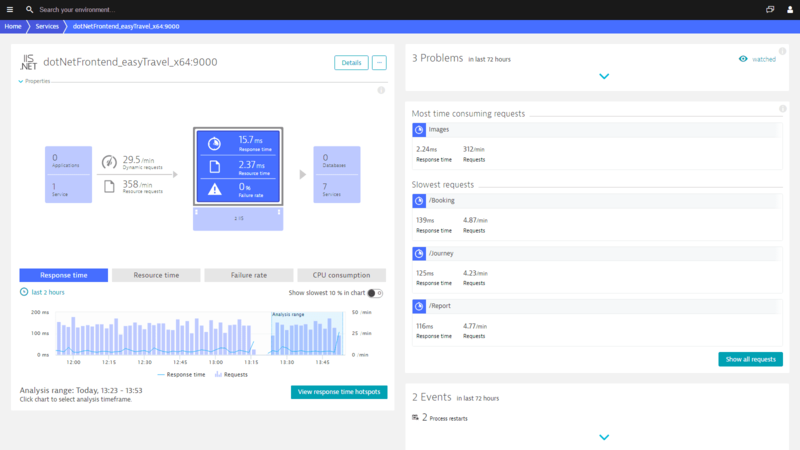 Dynatrace detects and diagnoses problems in real time—pinpointing root causes all the way down to the offending lines of code—before your customers are affected by them. 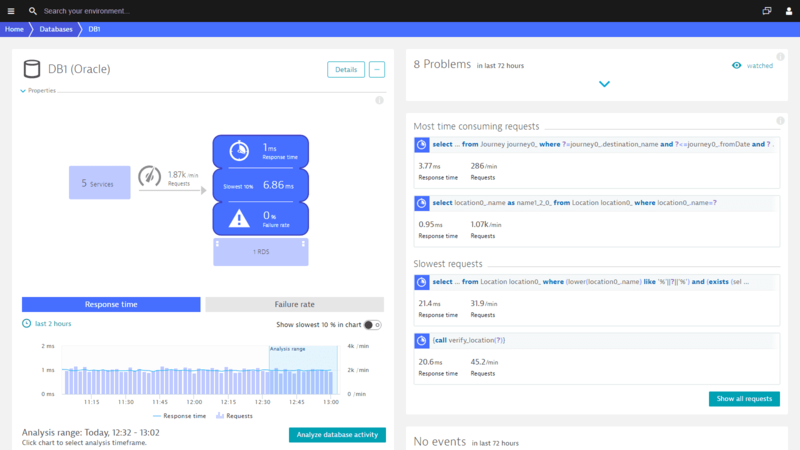 Proactively detect availability and performance problems across your stack. 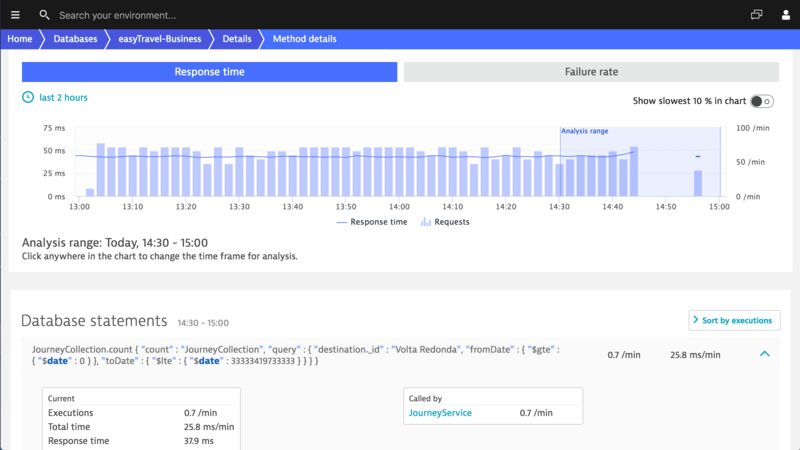 By applying big data analytics to billions of dependencies within your application stack, Dynatrace directly pinpoints the components that are causing problems. 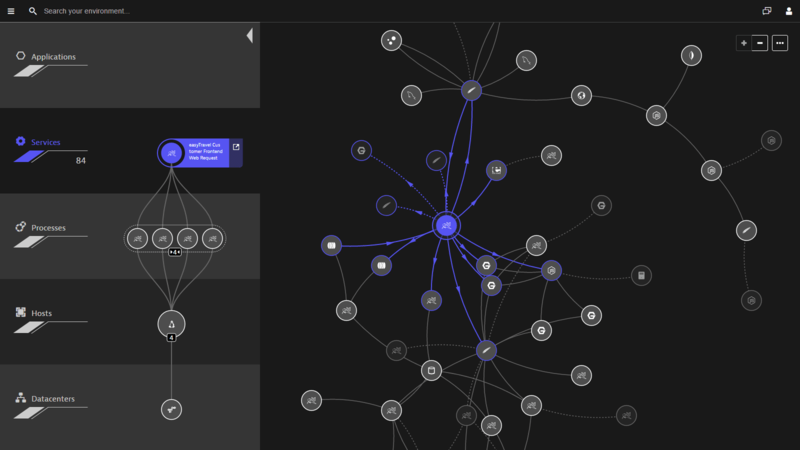 Visual replay of problem evolution helps you understand how problems evolved over time. 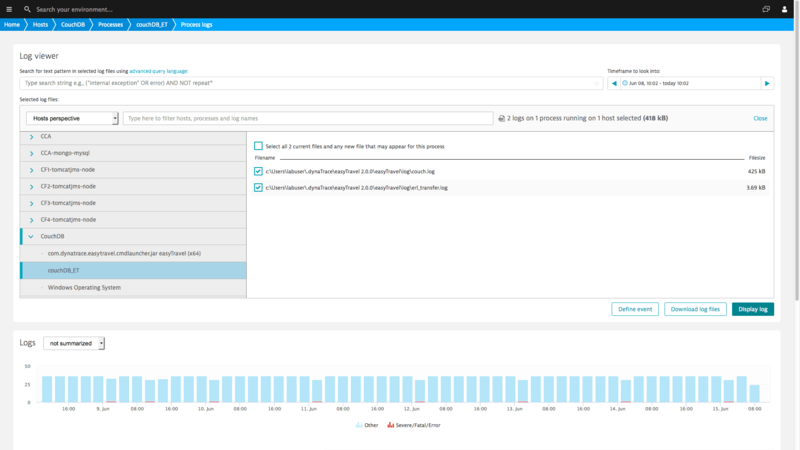 Dynatrace APM automatically detects and visualizes your web application and its dependencies end to end—from website, to application, to container, infrastructure, and cloud. 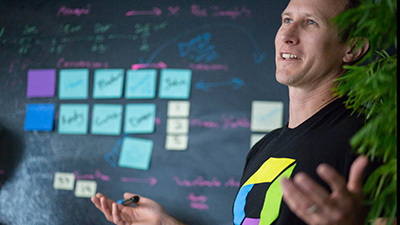 Our application performance management solution works out-of-the-box with zero configuration. 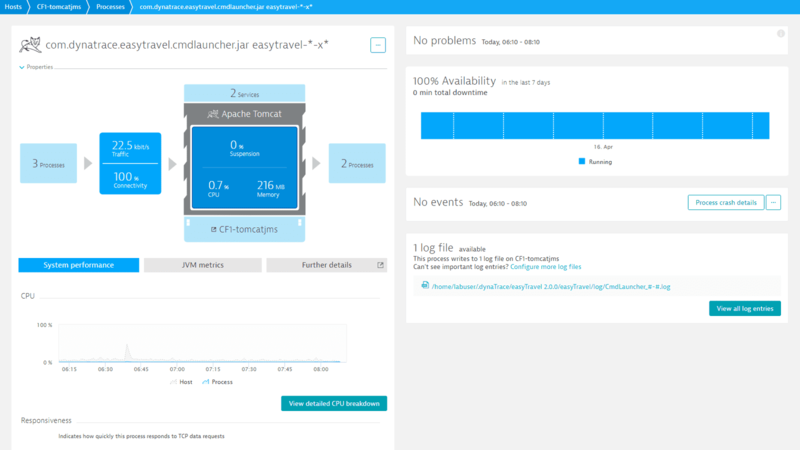 Our unique performance tool was designed for cloud environments where instances are rapidly created and deployed, making it a perfect fit for microservices environments. 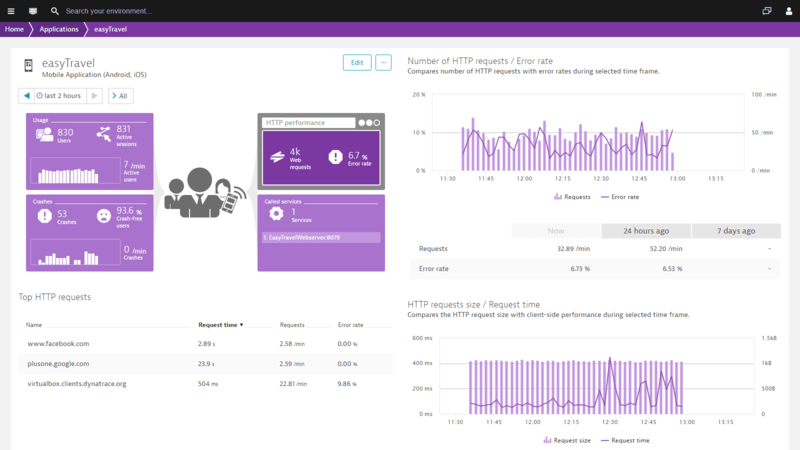 Dynatrace provides a clear picture of all inbound and outbound process connections running over your network interfaces (both physical and virtual) and automatically discovers all log files on your monitored hosts and processes. Understand the actual throughput and network-communications data of your communicating hosts and processes. 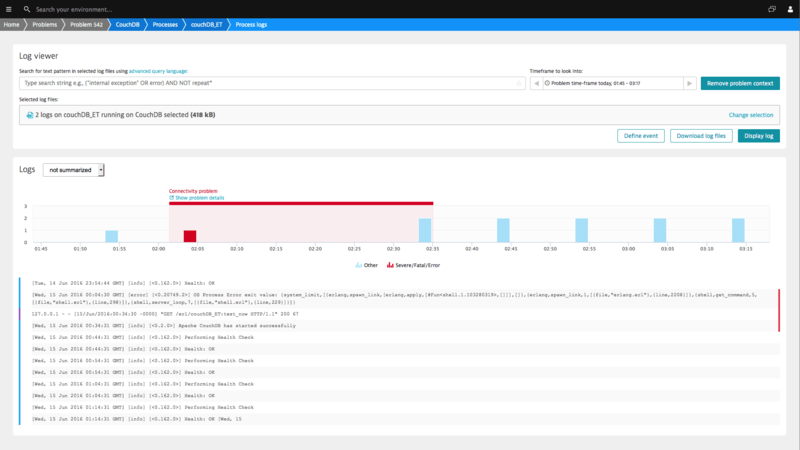 Relevant log messages and networking anomalies are factored into problem root-cause analysis. 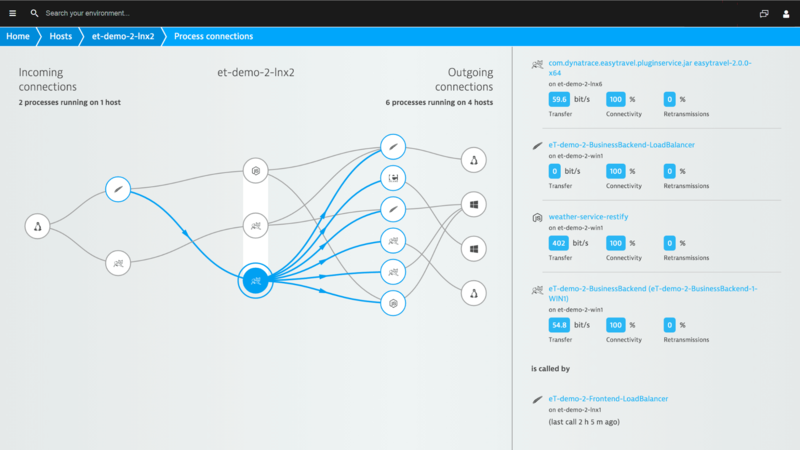 We integrate with your DevOps toolchain to automate issue detection during QA and testing. 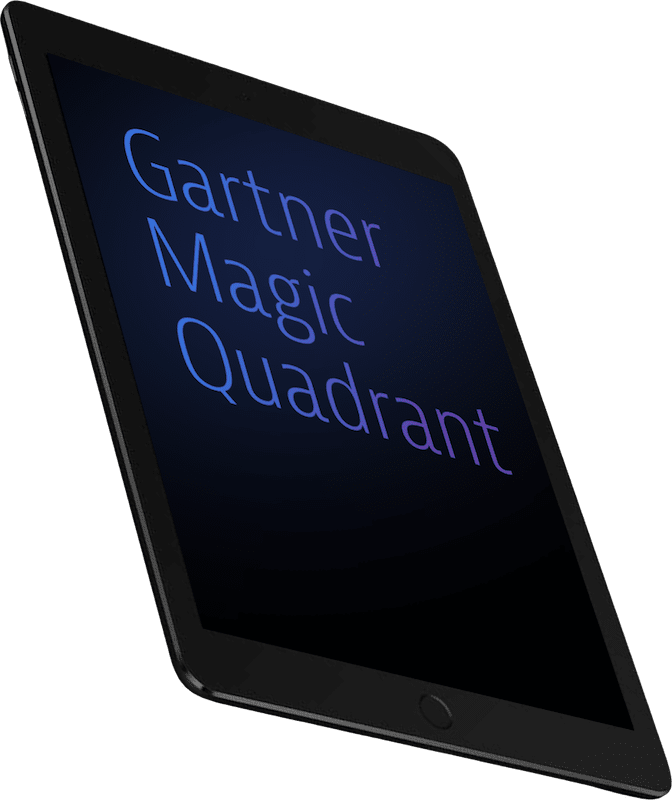 Download our exclusive eBook 7 performance metrics to release better software faster—no registration required—to see some real-life examples of application failures and how to avoid them. 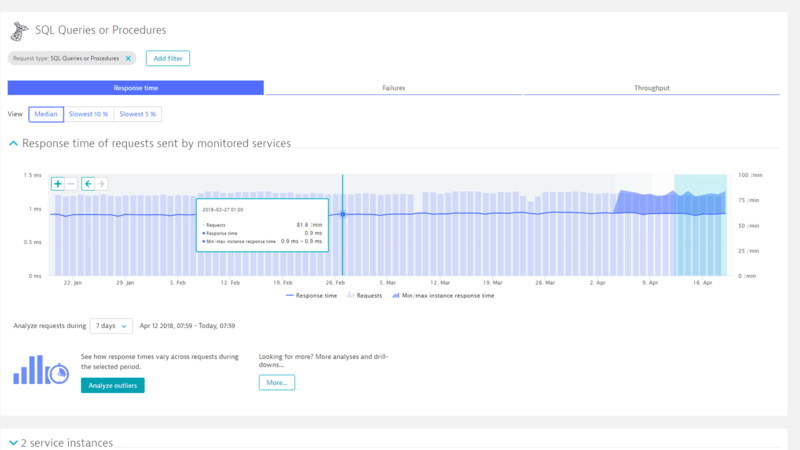 Sign up for our exclusive DevOps Performance Clinic webinar Metrics Driven-DevOps: Delivering High Quality Software to learn the four technical metrics you should be tracking to identify software issues before they crash your system. Need a more rapid deployment model but not sure if you can technically deliver? 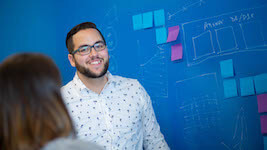 Read this blog post to learn which critical success factors to measure and monitor whether you&apos;re moving in the right direction.